The SBI Card Unnati Mastercard currently has an Informr score of 8 out of 10. This score is based on our evaluation of 2 sources including reviews from users and the web's most trusted critics. 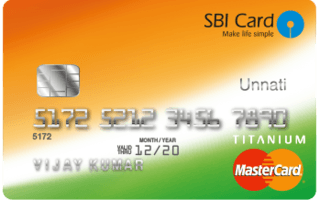 SBI Card Unnati Mastercard is typically available to those with good credit scores (650 or greater). Yes Provide a minimum security deposit of ₹25000. Although the annual fee of Rs. 499 is waived off for first four years, the reward rate is very low (0.25%). If you don’t mind paying the annual fee of Rs. 499, you should opt for other credit cards that offer much better reward rates. Waived on the first 4 years. Earn Rs. 500 cash back on spends of Rs 50,000 per year. 1% fuel surcharge waived off on every transaction of Rs. 500 - Rs. 3,000 (A maximum surcharge waiver of Rs. 100 per statement cycle). While providing the customer with the same benefits given by almost any other credit card out there, SBI does this without the customer having to worry about maintaining an impeccable credit history. Issuing credit cards based on the account held by the individual is a revolutionary step and can bring a lot of people into the digital fold.